Win a $50 Gift Certificate to Siena Tavern! Congratulations to Deanna Chang on winning our ninety eighth High Five Giveaway! Thanks to all who entered. 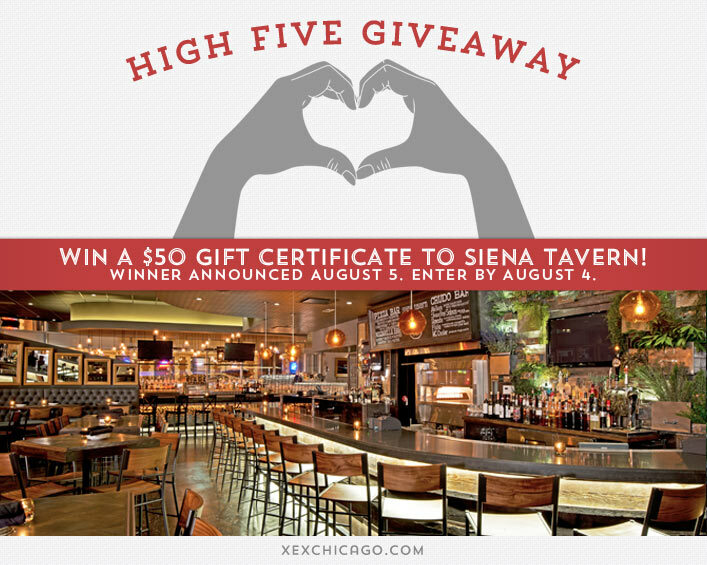 For our next High Five Giveaway we have a $50 gift certificate to Siena Tavern. Siena Tavern will bring the sophistication and charisma of Viviani’s cuisine as well as the energy of a bustling bar, to the epicenter of Chicago’s dining scene in River North. Combining Fabio’s crowd-pleasing made-from-scratch menu with DineAmic’s success in the hospitality sphere, Siena Tavern offers diners an experience that is simultaneously comfortable, vibrant and social as well as polished. Located in the heart of Chicago’s River North neighborhood, Siena Tavern becomes the fourth hospitality concept from DineAmic Group, which currently owns and operates the highly successful Public House and Bull & Bear properties. Siena Tavern is located at 51 W Kinzie Street, Chicago. Visit their website at www.sienatavern.com or call them at 312-595-1322 for more information. Our latest blog post gives some ideas for music festival hair styles. What is the big Chicago music festival happening from August 1-3? Hint: It starts with an “L”! Now, just add a comment to this post with the right answer to be eligible to win! The winner will be announced on Tuesday, August 5. Enter by midnight on Monday, August 4. Lollapalooza is the name of the concert.